We are proud to be registered with the Canadian Kennel Club under our bloodline name Dragonsblood Chinese Shar Pei. As well as a member of The Chinese Shar Pei Club of America, where all Shar Pei had to be registered before the Canadian Kennel Club recognized the breed. We are located in the small town of Deroche in the North Fraser Valley of beautiful British Columbia, Canada. 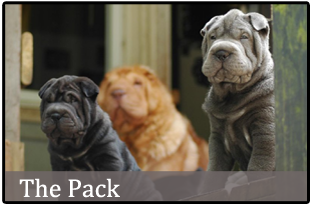 Our interest in the breed started in 1979 and we have been breeding Chinese Shar Pei since 1983. We are in good standing with the Canadian Kennel Club, the Chinese Shar Pei Club of America and with our clients. Check out our Shar Pei puppies for sale below. Thank you for choosing our Shar Pei breeders for your next fury loved one. Announcements are updated on our Facebook page. Welcome to the newest members of the Shar Peis By Sonja family! Sometimes due to unforeseen circumstances, a few of our Shar Pei friends may be looking for new homes. If you would be interested in giving these unfortunate family members a place in your hearts and homes, their information will be on our Facebook page or you can email us at sonjassharpeiss@gmail.com for their owners contact info. THANK YOU!! To all the wonderful families who have given our four-legged children a place in their homes and in their hearts. © 2019 Shar Peis by Sonja.